It was here Europa stepped on Cretan earth riding a bull. The bull disappeared and transformed Zeus into a human shape, and then under a plane tree in Gortyn Zeus and Europa produced three children: Minos, Rhadamanthus and Sarpidonas. 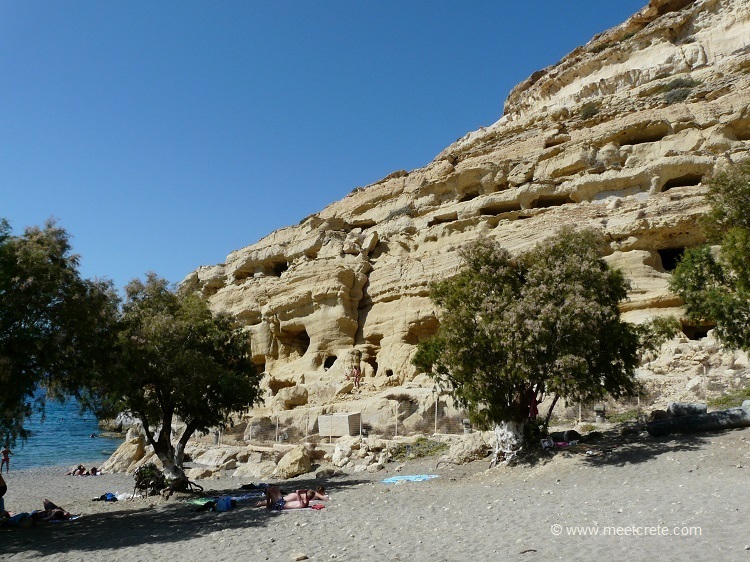 Humans can be traced from the Neolithic period who inhabited the caves of the sandstone hill on the western edge of the Matala Bay. and the young people from around the world of the 60s again turned these caves into dwellings. 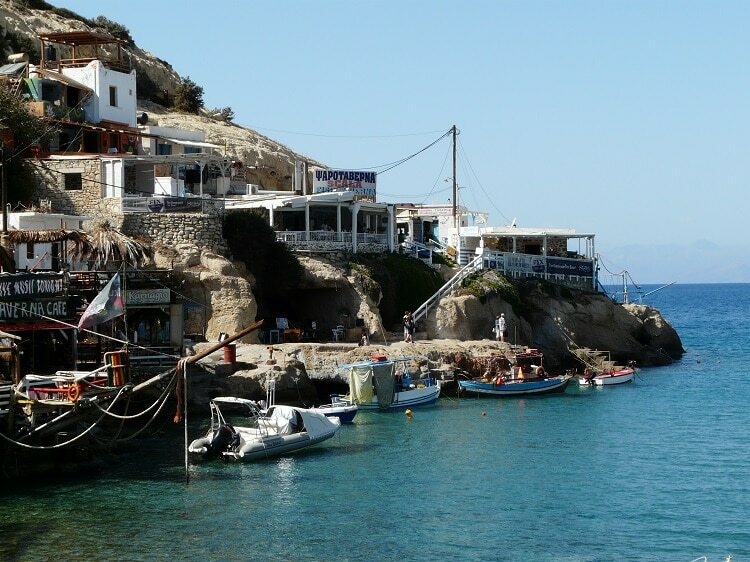 The bay of Matala has always served as an ideal port. 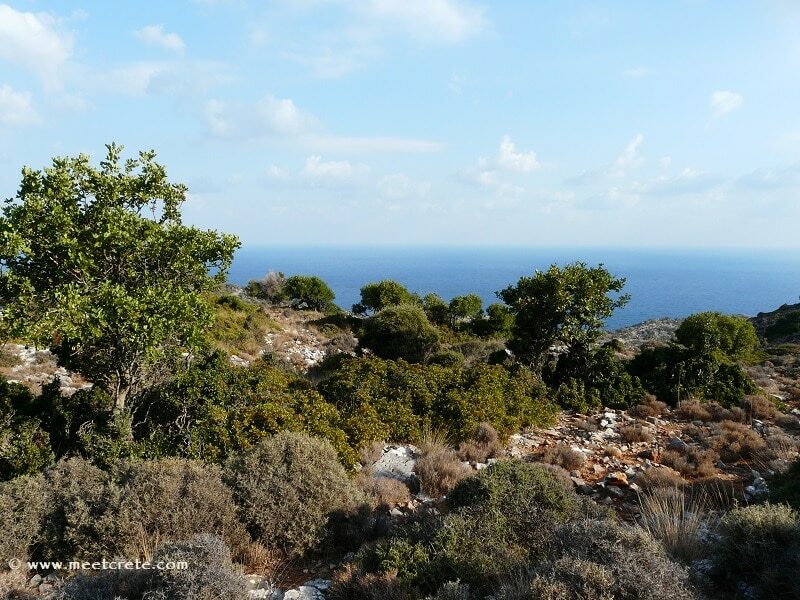 In Minoan times it was a port of Phaistos and under Roman rule it served as a port for the former island capital Gortyn. 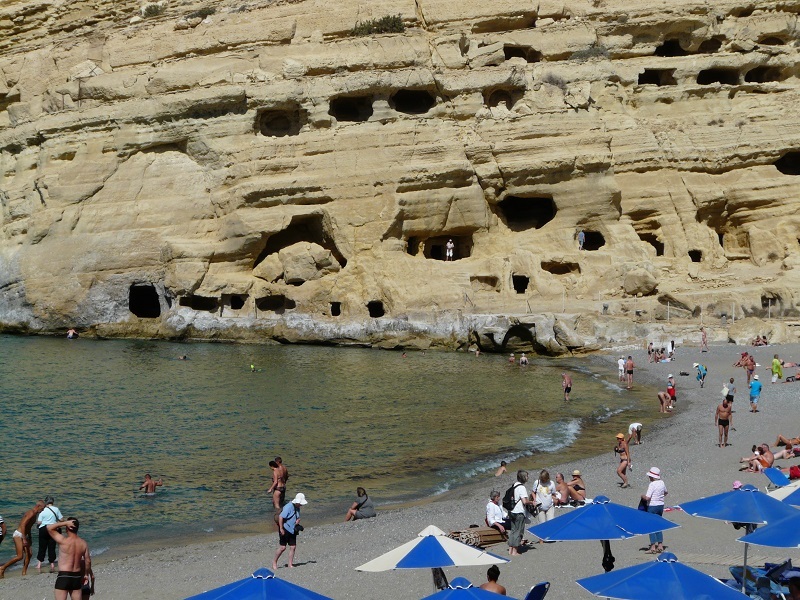 Matala owes its present fame to its caves. For decades, it has been a sightseeing spot for tourists travelling by excursion buses, who marvel at the strange caves and enjoy a swim in the beautiful sandy bay. For years the cave area was fenced off and it was impossible to visit them. Now the caves are open again to the public and can be visited by paying an entrance fee. They are certainly impressive …. 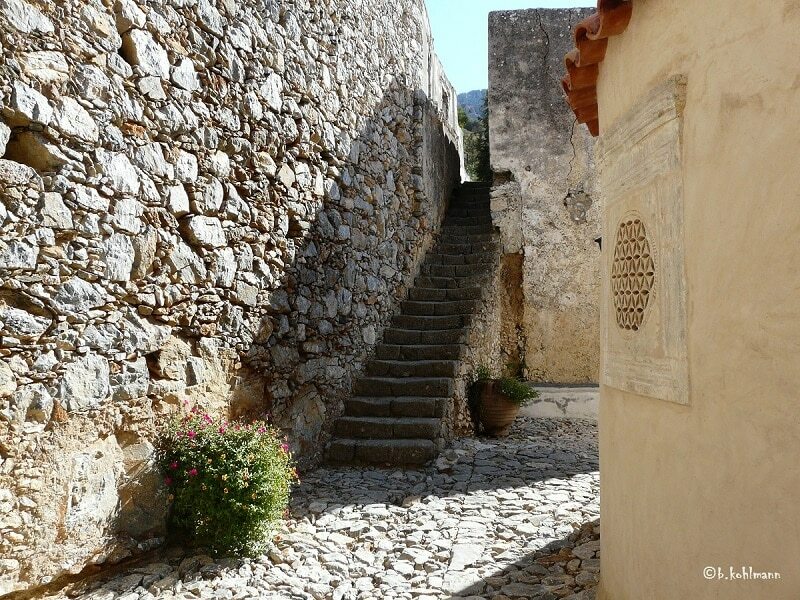 but imagine the inhabitants of the 60s sleeping here above Roman skeletons …. I personally found it a bit scary in the caves! 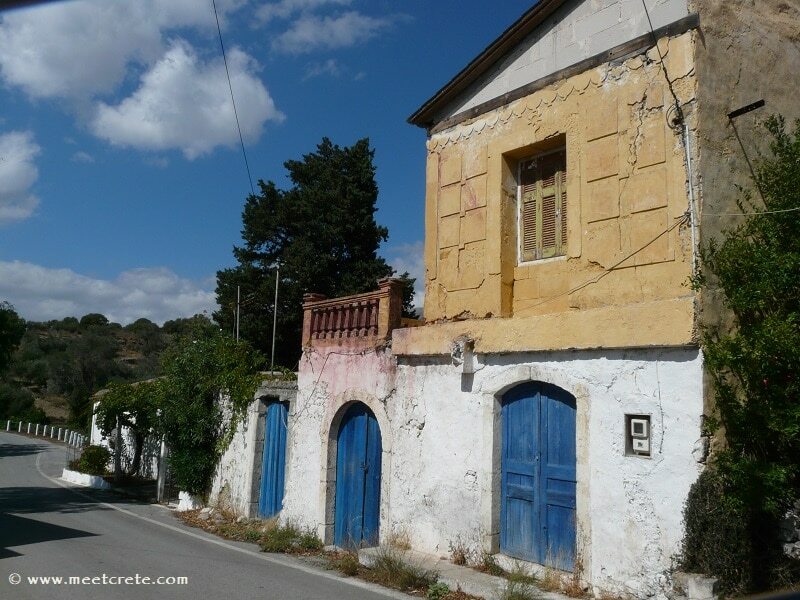 There is hardly a building in Matala that has not been exploited for tourism. 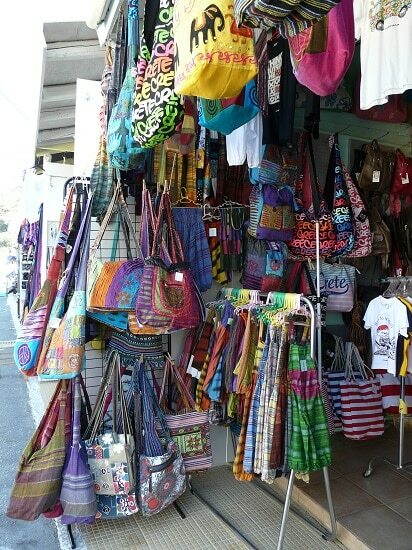 Souvenir shops, restaurants and taverns dominate the main road. 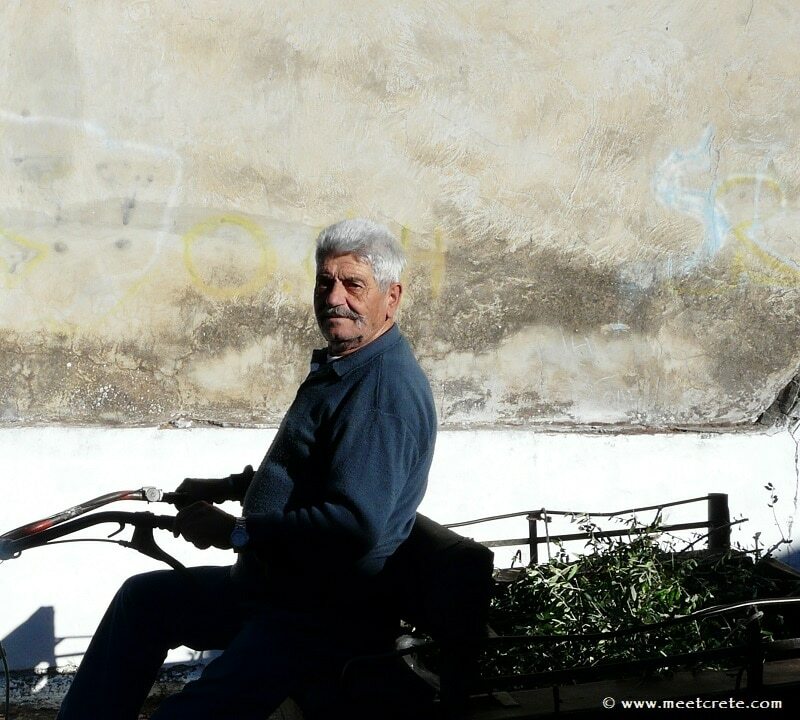 But if you sit on one of the terraces overlooking the beach, you no longer care about exploitation and what truly matters is the summer atmosphere, the sun, the sea and the light. And the rock inscription: Today is life, tomorrow never comes. 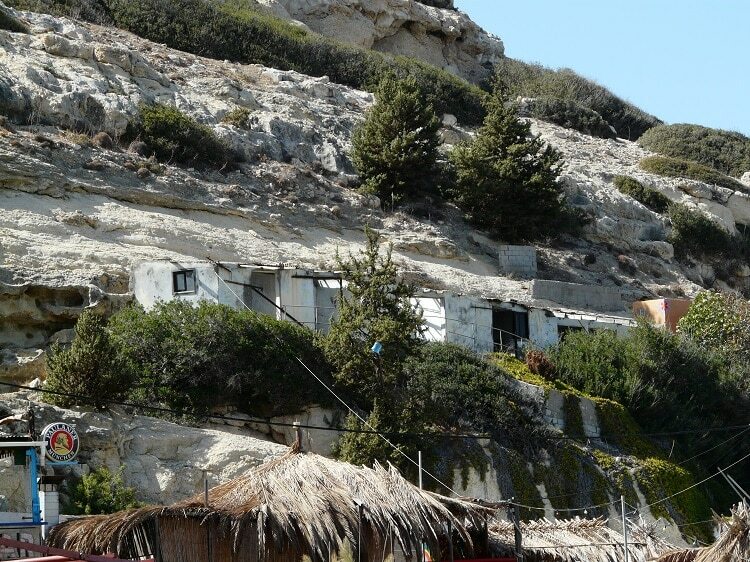 This must be last original houses of Matala. Are they still there? Since 2011 the Matala Beach Festival takes place on the beach. 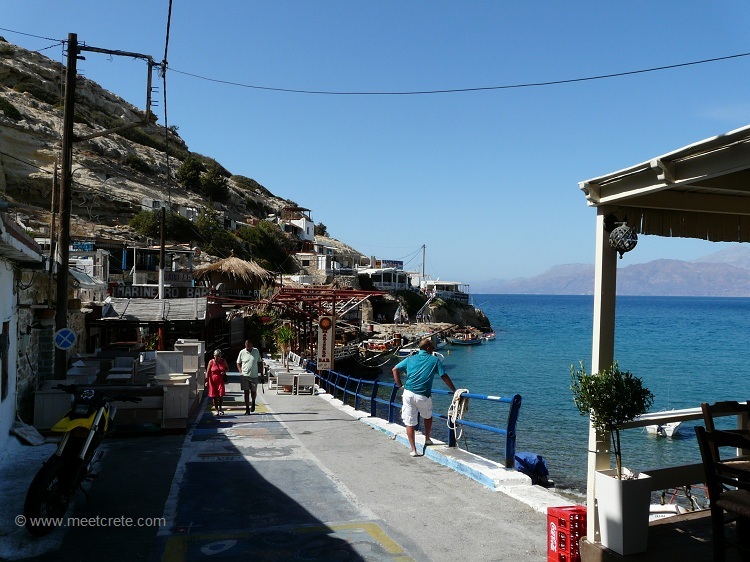 In its first year it was called Matala Reunion Festival and launched by the German writer and journalist Arn Strohmeyer (he was 1967 in Matala), his publisher Thomas Balistier and the city of Phaistos. Obviously, this festival was crowned with success, and that’s why it now takes place annually. … is a motto painted on the long white wall at the beach. They say that “ Matala-Giorgos” painted it and it seems, after much discussion, it has to do with the war in Vietnam. 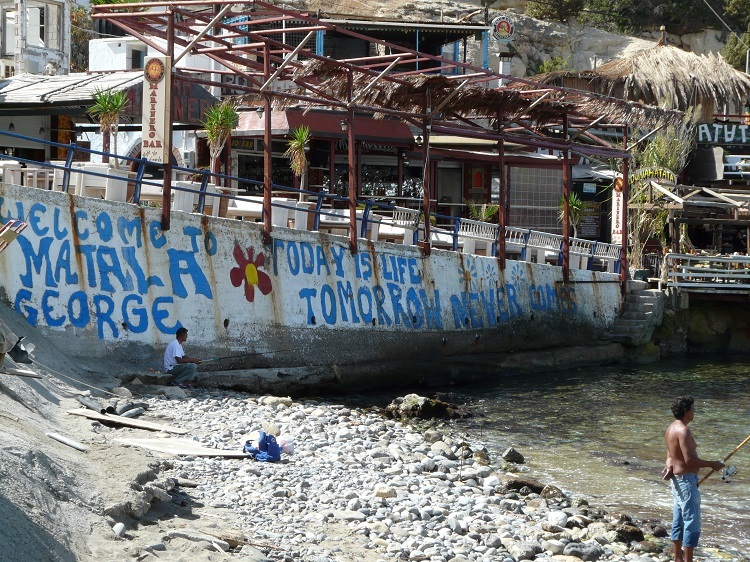 Some of the Vietnam War objectors from the United States of America had found refuge in Matala, which also formed the background of the violent dissolution of the hippie scene in Matala in May 1970. The village itself has a beautiful sandy beach. After half an hour’s walk from the old church and following the signs over the hill you arrive at the Red Beach, a copper-colored sand beach. The walk can be tiring in the blazing sun. 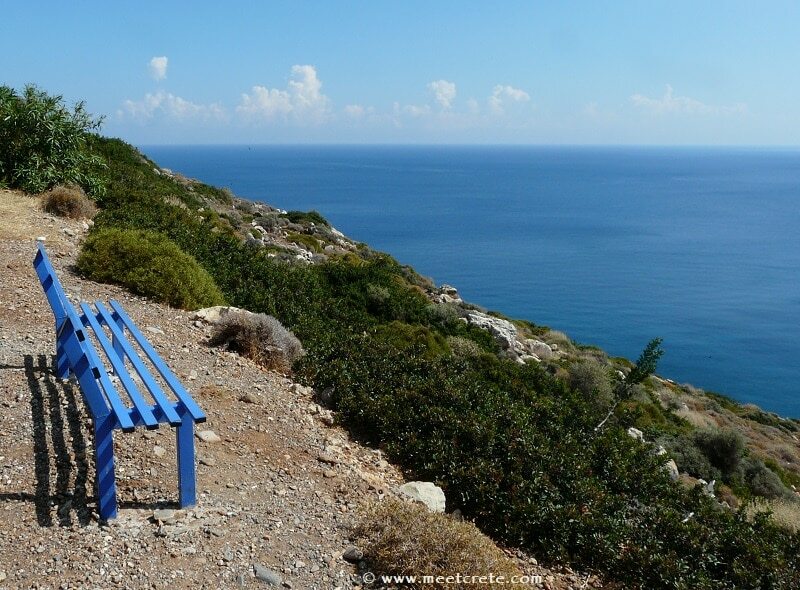 Activities: visit the archaeological sites Phaistos and Gortyn, Heraklion is not far. 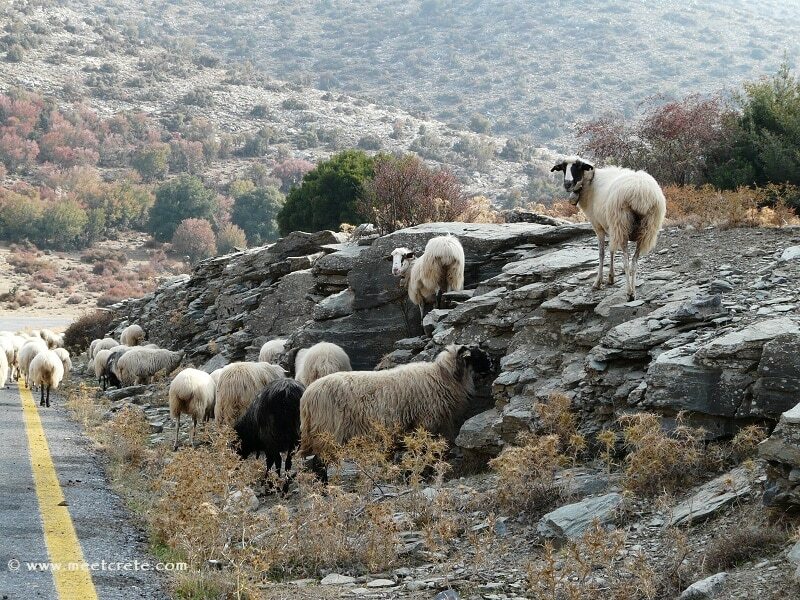 Agia Galini is certainly worth a trip to the west, and the mountain resort Zaros is quite famous among locals for its spring water and its trout farm in the adjoining lake.